Warming, small enough to consume one-handed and healthy(ish), a good samosa really ticks all the boxes for the perfect snack this #Veganuary. So what better time to go on a journey to find the best in the city? Verdict: filo samosas are a definite guilty pleasure. Guilty as any filo-wrapped filling shouldn’t be called a samosa but pleasure as these are and are delicious. The filling was light and adequately turmeric’d. The samosa also came with a delightful vegan mango mayonnaise dip, this and the pastry justifies the otherwise hefty price-tag. Verdict: by far the smallest samosa in the list, I finished one in less than two bites. Before trying them I was dubious of what role sweet potato would play in a samosa. After trying them I was certain it should be none. This is clear from HISBE’s failed attempt at making an alternative samosa. Filling: Well spiced potatoes, peas, carrots. Verdict: it could be considered cheating to include Taj but no self-respecting samosa list of Brighton could omit this international grocers. Perfect pastry, which stays crisp even when it’s cold, and delicious filling. The only reason it gets a 9 is location – it’s hard to find yourself passing Taj unless you live in Hove. Filling: potatoes, peas, tomatoes and lots of cumin seeds. Verdict: the only saving grace of this samosa was that it came heated. Turns out looks and prices can be deceiving; if going by these alone you would expect at least an 8/10 samosa as this was outrageously expensive. The taste of cumin was strong, which appealed to me but did not alleviate the burden of eating it. This samosa was a wolf in sheep’s clothing; or a bad samosa in good samosa’s pastry, hence the low score. Verdict: with ‘pastry thinner than a condom’ as described by my samosa-sidekick, you should err on the side of caution before approaching a Tesco samosa. Sometimes able to hit the spot, always unable to stay together after the first bite, unless you have a portable cutlery set these are probably best avoided. Verdict: one of the largest samosas, Waitrose doesn’t have an image of an onion on its packaging for no reason. This was a welcome addition, cutting through the potato-and-pea heavy offerings from the other supermarkets. Verdict: these samosas are Punjabi style so the pastry is different and flakier than the other contenders. It was probably the most authentic, the perfect accompaniment to a train journey. Verdict: The pastry was made of spelt flour, which should have been an initial indicator of any funny business but the triangle felt study and potentially crispy in my hand so I gave the Sunny-Foods-branded samosa the benefit of the doubt. 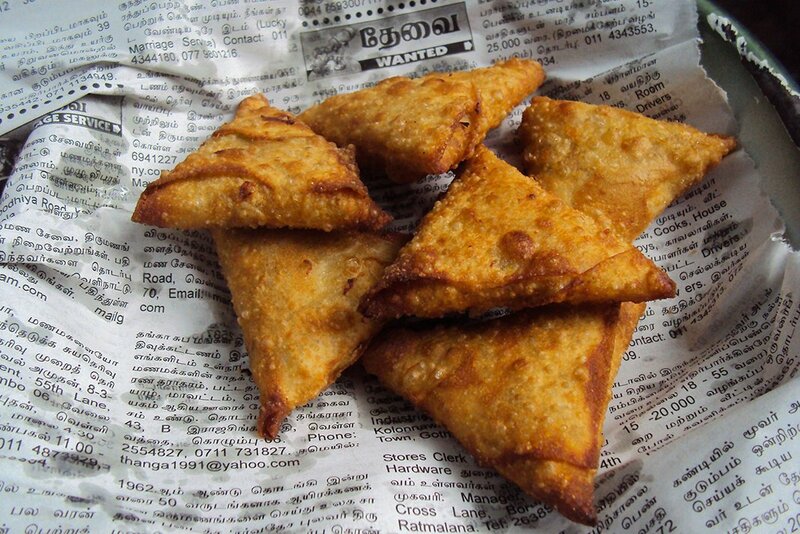 My kindness was futile though, I have only one word to describe this samosa – DRY. Verdict: Of all the supermarket samosas, Sainsbury’s was definitely the worst. The abysmal pastry to filling ratio was a product of their decision to split off into two samosas, leaving only disappointment in its wake. Verdict: you can really taste the additional veg, particularly the cauliflower, which instantly gives this samosa a boost over all the others. The flavour is strongly spiced, if a little bitter, but the change in texture more than makes up for this. Verdict: Not strictly ready-to-eat as it has to be ordered at the bar but if you’re near Western Road and after a pint I’d recommend settling down with this pair of sweet samosas. Juicy whole cherries fill filo pastry, topped with caramelised cookie crumbling and accompanied by peppermint ice cream which tastes like melted Fry’s peppermint cream. For more samosa content and up to date reviews check out @btn_samosa_sagas on Instagram.